Orchids in bloom have such a powerful allure that many people succumb and bring one home, usually a showy moth orchid (Phalaenopsis spp). Unfortunately, many of these "easy-to-grow" beauties end up dead relatively quickly. This has earned orchids a reputation for being difficult and picky as houseplants. But that isn't necessarily the truth. It just means that the moth orchids were not getting proper orchid care. 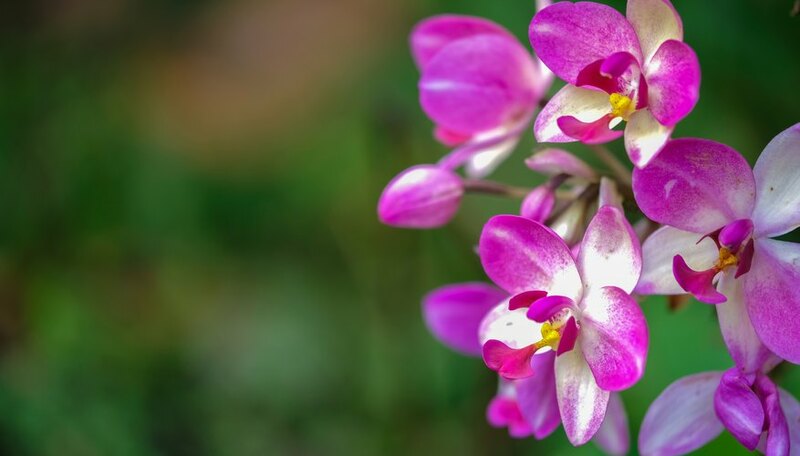 Before you adopt an orchid, you should read up on these magical plants and learn what they need to be happy and healthy. Here are some tips to get you started. Think of orchids as visitors from a foreign land where customs and habits are completely different. Your job is to make these beautiful guests feel as much at ease as possible by duplicating the conditions in their home land, the rainforest. Rainforests are crowded places, and many small plants live in the tall trees, attached to their branches and trunks. These plants absorb light, water and nutrients, then turn sunlight into energy through photosynthesis. The air is humid and breezy, the temperatures warm during the day and cool at night. Orchids grow as epiphytes or air plants, living on trees, not on the ground. This has many advantages for the plant, such as not being shaded by dense growth on the forest floor. Orchid roots are spongy and made to absorb water and nutrients as the nutrients wash over the tree in the rains. warm daytime temperatures of 65 to 75 degrees Fahrenheit, with a little cooler temperatures at night. Let's say you just walked into your house with a new moth orchid from the plant store. It's in a cheap plastic pot, but offers a million-dollar bloom. Don't try to transplant it while it's blooming. Just enjoy the blossom while it lasts. Once the bloom is done, clip off the dead flower spike and repot the plant. The main takeaway here is not to use soil, even potting soil. Potting an orchid in soil will deprive the roots of oxygen and kill the plant rapidly. Instead, repot your orchid in bark chips, pebbles or some similar, loosely packed material. The idea is to allow air to get to the roots while encouraging water to drain away quickly. You'll need to water the orchid much more during the growing season than in winter. Douse it with water a couple times a week, allowing those roots to soak it up. Once a week, add liquid fertilizer to the water. In winter, don't use fertilizer and reduce watering to once a month. At all times, keep your orchid in a warm environment. If your home drops below 65 degrees Fahrenheit during the day or 55 at night, your orchid won't be happy. An east-facing window works well to get the plant some sun but not too much. Direct afternoon sun should never touch the orchid's leaves. 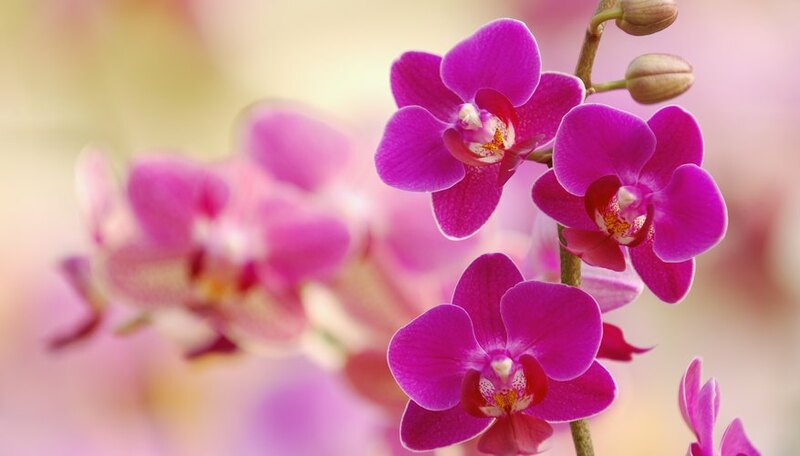 These are orchid care guidelines that work well for the moth orchid and some other popular orchids. But each species of orchid (and there are thousands) has its own care requirements. Look up its requirements online at the American Orchid Society website. For example, one type of orchid you will spot on the grocery store shelves is a hybrid Dendrobium phalaenopsis. Dendrobium hybrids require more of everything than do moth orchids: more light, more water, more warmth (no temperatures below 60 degrees) and more fertilizer. Like moth orchids, they will not tolerate soil packed around their roots and require excellent drainage.